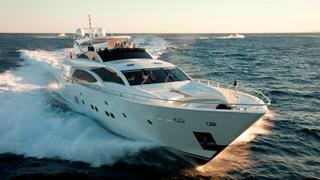 The 35 metre motor yacht Amadeus has been sold in a joint deal between Yachting Lodge and Yachts Invest. She will now be renamed Wave. Delivered in 2010 as a 3500 FLY flybridge model from French yard Couach with naval architecture by Exequiel Cano Lanza, her hull and superstructure were built in composite kevlar/GRP and she is Bureau Veritas classed. Her high-spec interiors designed by Danielle Chopard offer accommodation for up to ten guests in a master cabin, two VIP double cabins and a twin cabin – all with ensuite facilities - with the option to convert the master cabin into two doubles. Three crew cabins also offer accommodation for five staff members. A light and airy main saloon offers plenty of seating around a coffee table as well as a formal dining area while the country-style galley offers further seating for causal meals and snacks. A further dining area can be found on the aft deck while her top deck is equipped with large sunpads for relaxation. Powered by two MTU 16V 2000 engines this sporty superyacht is capable of reaching a top speed of 30 knots with a zippy cruising speed of 25 knots and a range of 1,200 nautical miles when travelling at 12 knots. Amadeus was sold with a well-stocked toy box equipped with a tender and Jet Ski. Lying in the South of France, Amadeus was asking €4,300,000.